A set of app icons in a litho style. Is there a better alternative to Litho Extra Icons Volume? Is Litho Extra Icons Volume really the best app in Icons category? Will Litho Extra Icons Volume work good on macOS 10.13.4? With Litho Extra Icons Volume, Anthony Piriano has pulled the acid-etched plates of the Iconfactory's popular Litho family out of the drawer and pressed out a new batch of goodies. 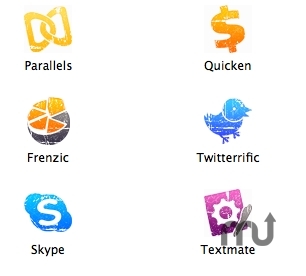 This latest set includes user requested application icons such as Skype, Textmate, MSN Messenger, and even the Iconfactory's own latest offerings Frenzic and Twitterrific. Have fun! Litho Extra Icons Volume needs a review. Be the first to review this app and get the discussion started! Litho Extra Icons Volume needs a rating. Be the first to rate this app and get the discussion started!